THE PROMISE of God to Abraham was fulfilled through Isaac and Jacob. That is made clear in the chapters we studied this week, Genesis 23 through 26. This week, we look at the death of Sarah, the faithfulness of the servant of Abraham (possibly Eliezer of Damascus) who traveled more than 500 miles on camelback to Aram-Naharaim to find a wife for Isaac. We examine the place and the people where Abraham purchased land for a burial tomb, Esau’s disposition of his birthright, and another example of the anxieties those chosen by God to bring forth His plans as Isaac repeats the lie of his father, calling his wife his “sister” while living in the land of Abimelech, the king of Gerar. 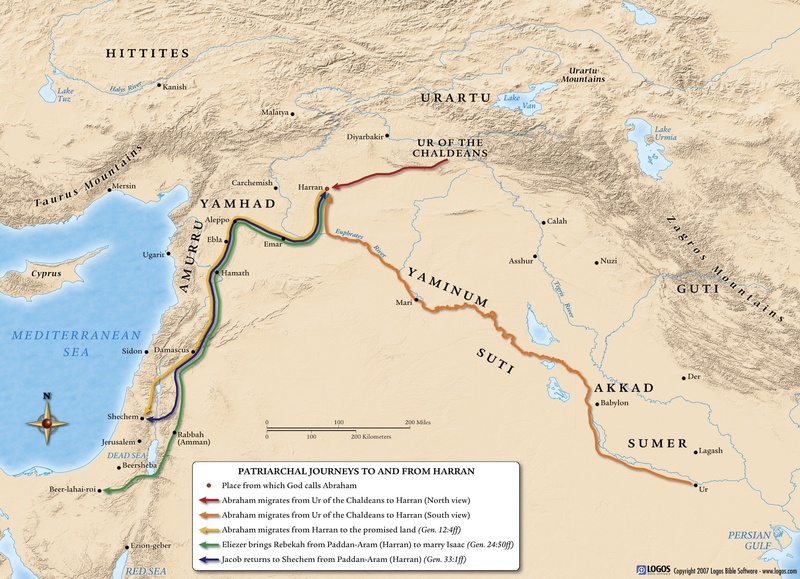 The map at left shows the routes traveled by Abraham (we subscribe to the Northern Route theory, marked in red), his servant, and Jacob as they traveled to and from Abraham’s ancestral homeland in what is today southeastern Turkey.